One naturally goes first to the Holy Sepulchre. It is right in the city, near the western gate; it and the place of the Crucifixion, and, in fact, every other place intimately connected with that tremendous event, are ingeniously massed together and covered by one roof—the dome of the Church of the Holy Sepulchre. Entering the building, through the midst of the usual assemblage of beggars, one sees on his left a few Turkish guards—for Christians of different sects will not only quarrel, but fight, also, in this sacred place, if allowed to do it. Before you is a marble slab, which covers the Stone of Unction, whereon the Saviour's body was laid to prepare it for burial. It was found necessary to conceal the real stone in this way in order to save it from destruction. Pilgrims were too much given to chipping off pieces of it to carry home. Near by is a circular railing which marks the spot where the Virgin stood when the Lord's body was anointed. Entering the great Rotunda, we stand before the most sacred locality in Christendom—the grave of Jesus. It is in the centre of the church, and immediately under the great dome. It is inclosed in a sort of little temple of yellow and white stone, of fanciful design. Within the little temple is a portion of the very stone which was rolled away from the door of the Sepulchre, and on which the angel was sitting when Mary came thither "at early dawn." Stooping low, we enter the vault—the Sepulchre itself. It is only about six feet by seven, and the stone couch on which the dead Saviour lay extends from end to end of the apartment and occupies half its width. It is covered with a marble slab which has been much worn by the lips of pilgrims. This slab serves as an altar, now. Over it hang some fifty gold and silver lamps, which are kept always burning, and the place is otherwise scandalized by trumpery, gewgaws, and tawdry ornamentation. 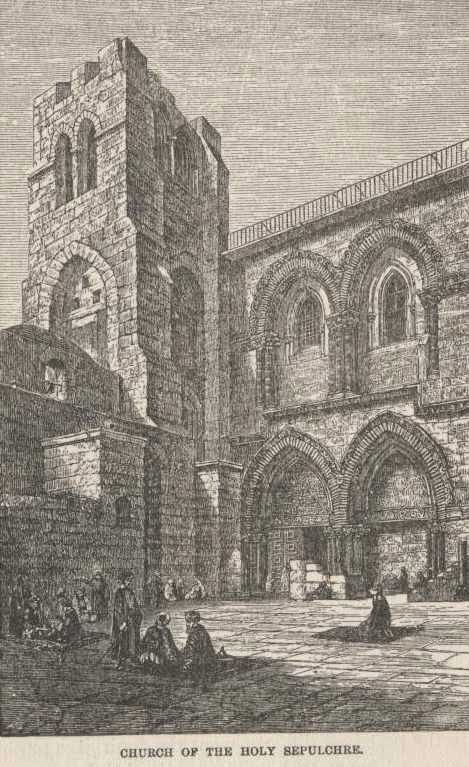 All sects of Christians (except Protestants,) have chapels under the roof of the Church of the Holy Sepulchre, and each must keep to itself and not venture upon another's ground. It has been proven conclusively that they can not worship together around the grave of the Saviour of the World in peace. The chapel of the Syrians is not handsome; that of the Copts is the humblest of them all. It is nothing but a dismal cavern, roughly hewn in the living rock of the Hill of Calvary. In one side of it two ancient tombs are hewn, which are claimed to be those in which Nicodemus and Joseph of Aramathea were buried. As we moved among the great piers and pillars of another part of the church, we came upon a party of black-robed, animal-looking Italian monks, with candles in their hands, who were chanting something in Latin, and going through some kind of religious performance around a disk of white marble let into the floor. It was there that the risen Saviour appeared to Mary Magdalen in the likeness of a gardener. Near by was a similar stone, shaped like a star—here the Magdalen herself stood, at the same time. Monks were performing in this place also. They perform everywhere—all over the vast building, and at all hours. Their candles are always flitting about in the gloom, and making the dim old church more dismal than there is any necessity that it should be, even though it is a tomb. We were shown the place where our Lord appeared to His mother after the Resurrection. Here, also, a marble slab marks the place where St. Helena, the mother of the Emperor Constantine, found the crosses about three hundred years after the Crucifixion. According to the legend, this great discovery elicited extravagant demonstrations of joy. But they were of short duration. The question intruded itself: "Which bore the blessed Saviour, and which the thieves?" To be in doubt, in so mighty a matter as this — to be uncertain which one to adore — was a grievous misfortune. It turned the public joy to sorrow. But when lived there a holy priest who could not set so simple a trouble as this at rest? One of these soon hit upon a plan that would be a certain test. A noble lady lay very ill in Jerusalem. The wise priests ordered that the three crosses be taken to her bedside one at a time. It was done. When her eyes fell upon the first one, she uttered a scream that was heard beyond the Damascus Gate, and even upon the Mount of Olives, it was said, and then fell back in a deadly swoon. They recovered her and brought the second cross. Instantly she went into fearful convulsions, and it was with the greatest difficulty that six strong men could hold her. They were afraid, now, to bring in the third cross. They began to fear that possibly they had fallen upon the wrong crosses, and that the true cross was not with this number at all. However, as the woman seemed likely to die with the convulsions that were tearing her, they concluded that the third could do no more than put her out of her misery with a happy dispatch. So they brought it, and behold, a miracle! The woman sprang from her bed, smiling and joyful, and perfectly restored to health. When we listen to evidence like this, we cannot but believe. We would be ashamed to doubt, and properly, too. Even the very part of Jerusalem where this all occurred is there yet. So there is really no room for doubt. The priests tried to show us, through a small screen, a fragment of the genuine Pillar of Flagellation, to which Christ was bound when they scourged him. But we could not see it, because it was dark inside the screen. However, a baton is kept here, which the pilgrim thrusts through a hole in the screen, and then he no longer doubts that the true Pillar of Flagellation is in there. He can not have any excuse to doubt it, for he can feel it with the stick. He can feel it as distinctly as he could feel any thing. Not far from here was a niche where they used to preserve a piece of the True Cross, but it is gone, now. This piece of the cross was discovered in the sixteenth century. The Latin priests say it was stolen away, long ago, by priests of another sect. That seems like a hard statement to make, but we know very well that it was stolen, because we have seen it ourselves in several of the cathedrals of Italy and France. Still moving through the gloom of the Church of the Holy Sepulchre we came to a small chapel, hewn out of the rock—a place which has been known as "The Prison of Our Lord" for many centuries. Tradition says that here the Saviour was confined just previously to the crucifixion. Under an altar by the door was a pair of stone stocks for human legs. These things are called the "Bonds of Christ," and the use they were once put to has given them the name they now bear. 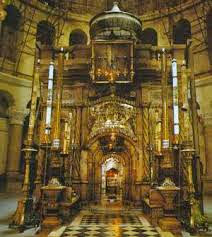 The Greek Chapel is the most roomy, the richest and the showiest chapel in the Church of the Holy Sepulchre. Its altar, like that of all the Greek churches, is a lofty screen that extends clear across the chapel, and is gorgeous with gilding and pictures. The numerous lamps that hang before it are of gold and silver, and cost great sums. But the feature of the place is a short column that rises from the middle of the marble pavement of the chapel, and marks the exact centre of the earth. The most reliable traditions tell us that this was known to be the earth's centre, ages ago, and that when Christ was upon earth he set all doubts upon the subject at rest forever, by stating with his own lips that the tradition was correct. Remember, He said that that particular column stood upon the centre of the world. If the centre of the world changes, the column changes its position accordingly. This column has moved three different times of its own accord. This is because, in great convulsions of nature, at three different times, masses of the earth—whole ranges of mountains, probably—have flown off into space, thus lessening the diameter of the earth, and changing the exact locality of its centre by a point or two. This is a very curious and interesting circumstance, and is a withering rebuke to those philosophers who would make us believe that it is not possible for any portion of the earth to fly off into space. To satisfy himself that this spot was really the centre of the earth, a sceptic once paid well for the privilege of ascending to the dome of the church to see if the sun gave him a shadow at noon. He came down perfectly convinced. The day was very cloudy and the sun threw no shadows at all; but the man was satisfied that if the sun had come out and made shadows it could not have made any for him. Proofs like these are not to be set aside by the idle tongues of cavilers. To such as are not bigoted, and are willing to be convinced, they carry a conviction that nothing can ever shake. If even greater proofs than those I have mentioned are wanted, to satisfy the headstrong and the foolish that this is the genuine centre of the earth, they are here. The greatest of them lies in the fact that from under this very column was taken the dust from which Adam was made. This can surely be regarded in the light of a settler. It is not likely that the original first man would have been made from an inferior quality of earth when it was entirely convenient to get first quality from the world's centre. This will strike any reflecting mind forcibly. That Adam was formed of dirt procured in this very spot is amply proven by the fact that in six thousand years no man has ever been able to prove that the dirt was not procured here whereof he was made. It is a singular circumstance that right under the roof of this same great church, and not far away from that illustrious column, Adam himself, the father of the human race, lies buried. 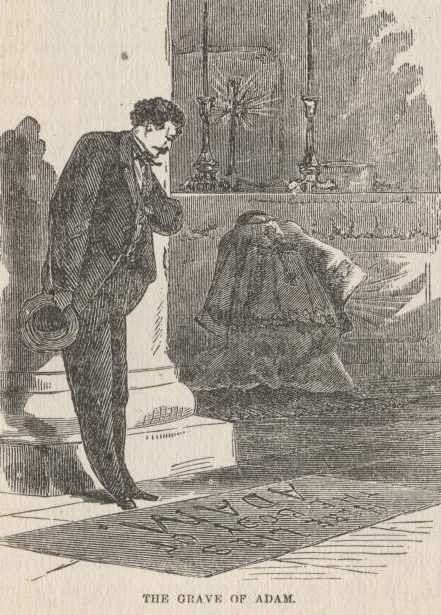 There is no question that he is actually buried in the grave which is pointed out as his—there can be none—because it has never yet been proven that that grave is not the grave in which he is buried. The tomb of Adam! How touching it was, here in a land of strangers, far away from home, and friends, and all who cared for me, thus to discover the grave of a blood relation. True, a distant one, but still a relation. The unerring instinct of nature thrilled its recognition. The fountain of my filial affection was stirred to its profoundest depths, and I gave way to tumultuous emotion. I leaned upon a pillar and burst into tears. I deem it no shame to have wept over the grave of my poor dead relative. Let him who would sneer at my emotion close this volume here, for he will find little to his taste in my journeyings through Holy Land. 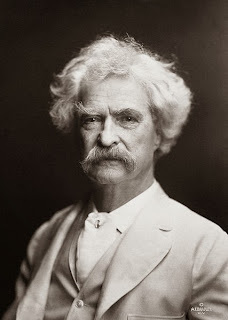 Noble old man—he did not live to see me—he did not live to see his child. And I—I—alas, I did not live to see him. Weighed down by sorrow and disappointment, he died before I was born—six thousand brief summers before I was born. But let us try to bear it with fortitude. Let us trust that he is better off where he is. Let us take comfort in the thought that his loss is our eternal gain. The next place the guide took us to in the holy church was an altar dedicated to the Roman soldier who was of the military guard that attended at the Crucifixion to keep order, and who—when the vail of the Temple was rent in the awful darkness that followed; when the rock of Golgotha was split asunder by an earthquake; when the artillery of heaven thundered, and in the baleful glare of the lightnings the shrouded dead flitted about the streets of Jerusalem—shook with fear and said, "Surely this was the Son of God!" Where this altar stands now, that Roman soldier stood then, in full view of the crucified Saviour—in full sight and hearing of all the marvels that were transpiring far and wide about the circumference of the Hill of Calvary. And in this self-same spot the priests of the Temple beheaded him for those blasphemous words he had spoken. In this altar they used to keep one of the most curious relics that human eyes ever looked upon—a thing that had power to fascinate the beholder in some mysterious way and keep him gazing for hours together. It was nothing less than the copper plate Pilate put upon the Saviour's cross, and upon which he wrote, "THIS IS THE KING OF THE JEWS." I think St. Helena, the mother of Constantine, found this wonderful memento when she was here in the third century. She traveled all over Palestine, and was always fortunate. Whenever the good old enthusiast found a thing mentioned in her Bible, Old or New, she would go and search for that thing, and never stop until she found it. If it was Adam, she would find Adam; if it was the Ark, she would find the Ark; if it was Goliath, or Joshua, she would find them. She found the inscription here that I was speaking of, I think. She found it in this very spot, close to where the martyred Roman soldier stood. That copper plate is in one of the churches in Rome, now. Any one can see it there. The inscription is very distinct. We passed along a few steps and saw the altar built over the very spot where the good Catholic priests say the soldiers divided the raiment of the Saviour. Then we went down into a cavern which cavilers say was once a cistern. It is a chapel, now, however—the Chapel of St. Helena. It is fifty-one feet long by forty-three wide. In it is a marble chair which Helena used to sit in while she superintended her workmen when they were digging and delving for the True Cross. In this place is an altar dedicated to St. Dimas, the penitent thief. A new bronze statue is here—a statue of St. Helena. It reminded us of poor Maximilian, so lately shot. He presented it to this chapel when he was about to leave for his throne in Mexico. From the cistern we descended twelve steps into a large roughly-shaped grotto, carved wholly out of the living rock. Helena blasted it out when she was searching for the true Cross. She had a laborious piece of work, here, but it was richly rewarded. Out of this place she got the crown of thorns, the nails of the cross, the true Cross itself, and the cross of the penitent thief. When she thought she had found every thing and was about to stop, she was told in a dream to continue a day longer. It was very fortunate. She did so, and found the cross of the other thief. The walls and roof of this grotto still weep bitter tears in memory of the event that transpired on Calvary, and devout pilgrims groan and sob when these sad tears fall upon them from the dripping rock. The monks call this apartment the "Chapel of the Invention of the Cross"—a name which is unfortunate, because it leads the ignorant to imagine that a tacit acknowledgment is thus made that the tradition that Helena found the true Cross here is a fiction—an invention. It is a happiness to know, however, that intelligent people do not doubt the story in any of its particulars. Priests of any of the chapels and denominations in the Church of the Holy Sepulchre can visit this sacred grotto to weep and pray and worship the gentle Redeemer. Two different congregations are not allowed to enter at the same time, however, because they always fight. Still marching through the venerable Church of the Holy Sepulchre, among chanting priests in coarse long robes and sandals; pilgrims of all colors and many nationalities, in all sorts of strange costumes; under dusky arches and by dingy piers and columns; through a sombre cathedral gloom freighted with smoke and incense, and faintly starred with scores of candles that appeared suddenly and as suddenly disappeared, or drifted mysteriously hither and thither about the distant aisles like ghostly jack-o'-lanterns—we came at last to a small chapel which is called the "Chapel of the Mocking." Under the altar was a fragment of a marble column; this was the seat Christ sat on when he was reviled, and mockingly made King, crowned with a crown of thorns and sceptred with a reed. It was here that they blindfolded him and struck him, and said in derision, "Prophesy who it is that smote thee." The tradition that this is the identical spot of the mocking is a very ancient one. The guide said that Saewulf was the first to mention it. I do not know Saewulf, but still, I cannot well refuse to receive his evidence—none of us can. They showed us where the great Godfrey and his brother Baldwin, the first Christian Kings of Jerusalem, once lay buried by that sacred sepulchre they had fought so long and so valiantly to wrest from the hands of the infidel. But the niches that had contained the ashes of these renowned crusaders were empty. Even the coverings of their tombs were gone—destroyed by devout members of the Greek Church, because Godfrey and Baldwin were Latin princes, and had been reared in a Christian faith whose creed differed in some unimportant respects from theirs. We passed on, and halted before the tomb of Melchisedek! You will remember Melchisedek, no doubt; he was the King who came out and levied a tribute on Abraham the time that he pursued Lot's captors to Dan, and took all their property from them. That was about four thousand years ago, and Melchisedek died shortly afterward. However, his tomb is in a good state of preservation. —at which time Helena came and built a church upon Calvary to commemorate the death and burial of the Lord and preserve the sacred place in the memories of men; since that time there has always been a church there. It is not possible that there can be any mistake about the locality of the Crucifixion. Not half a dozen persons knew where they buried the Saviour, perhaps, and a burial is not a startling event, anyhow; therefore, we can be pardoned for unbelief in the Sepulchre, but not in the place of the Crucifixion. Five hundred years hence there will be no vestige of Bunker Hill Monument left, but America will still know where the battle was fought and where Warren fell. The crucifixion of Christ was too notable an event in Jerusalem, and the Hill of Calvary made too celebrated by it, to be forgotten in the short space of three hundred years. I climbed the stairway in the church which brings one to the top of the small inclosed pinnacle of rock, and looked upon the place where the true cross once stood, with a far more absorbing interest than I had ever felt in any thing earthly before. I could not believe that the three holes in the top of the rock were the actual ones the crosses stood in, but I felt satisfied that those crosses had stood so near the place now occupied by them, that the few feet of possible difference were a matter of no consequence. When one stands where the Saviour was crucified, he finds it all he can do to keep it strictly before his mind that Christ was not crucified in a Catholic Church. He must remind himself every now and then that the great event transpired in the open air, and not in a gloomy, candle-lighted cell in a little corner of a vast church, up-stairs—a small cell all bejeweled and bespangled with flashy ornamentation, in execrable taste. Under a marble altar like a table, is a circular hole in the marble floor, corresponding with the one just under it in which the true Cross stood. The first thing every one does is to kneel down and take a candle and examine this hole. He does this strange prospecting with an amount of gravity that can never be estimated or appreciated by a man who has not seen the operation. Then he holds his candle before a richly engraved picture of the Saviour, done on a messy slab of gold, and wonderfully rayed and starred with diamonds, which hangs above the hole within the altar, and his solemnity changes to lively admiration. He rises and faces the finely wrought figures of the Saviour and the malefactors uplifted upon their crosses behind the altar, and bright with a metallic lustre of many colors. He turns next to the figures close to them of the Virgin and Mary Magdalen; next to the rift in the living rock made by the earthquake at the time of the Crucifixion, and an extension of which he had seen before in the wall of one of the grottoes below; he looks next at the show-case with a figure of the Virgin in it, and is amazed at the princely fortune in precious gems and jewelry that hangs so thickly about the form as to hide it like a garment almost. 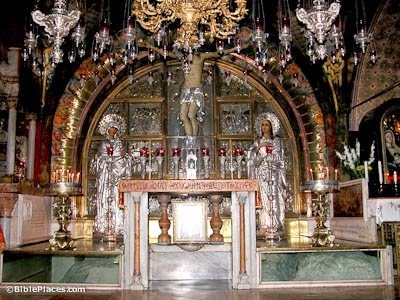 All about the apartment the gaudy trappings of the Greek Church offend the eye and keep the mind on the rack to remember that this is the Place of the Crucifixion—Golgotha—the Mount of Calvary. And the last thing he looks at is that which was also the first—the place where the true Cross stood. That will chain him to the spot and compel him to look once more, and once again, after he has satisfied all curiosity and lost all interest concerning the other matters pertaining to the locality. And so I close my chapter on the Church of the Holy Sepulchre—the most sacred locality on earth to millions and millions of men, and women, and children, the noble and the humble, bond and free. In its history from the first, and in its tremendous associations, it is the most illustrious edifice in Christendom. With all its clap-trap side-shows and unseemly impostures of every kind, it is still grand, revered, venerable—for a god died there; for fifteen hundred years its shrines have been wet with the tears of pilgrims from the earth's remotest confines; for more than two hundred, the most gallant knights that ever wielded sword wasted their lives away in a struggle to seize it and hold it sacred from infidel pollution. Even in our own day a war, that cost millions of treasure and rivers of blood, was fought because two rival nations claimed the sole right to put a new dome upon it. History is full of this old Church of the Holy Sepulchre—full of blood that was shed because of the respect and the veneration in which men held the last resting-place of the meek and lowly, the mild and gentle, Prince of Peace!